Our society suffers from a lack of understanding and empathy concerning the realities of poverty. Just Harvest’s poverty simulations help illuminate these realities and debunk the many stereotypes about “the poor”. We regularly conduct these simulations for other organizations, government agencies, schools, and companies. 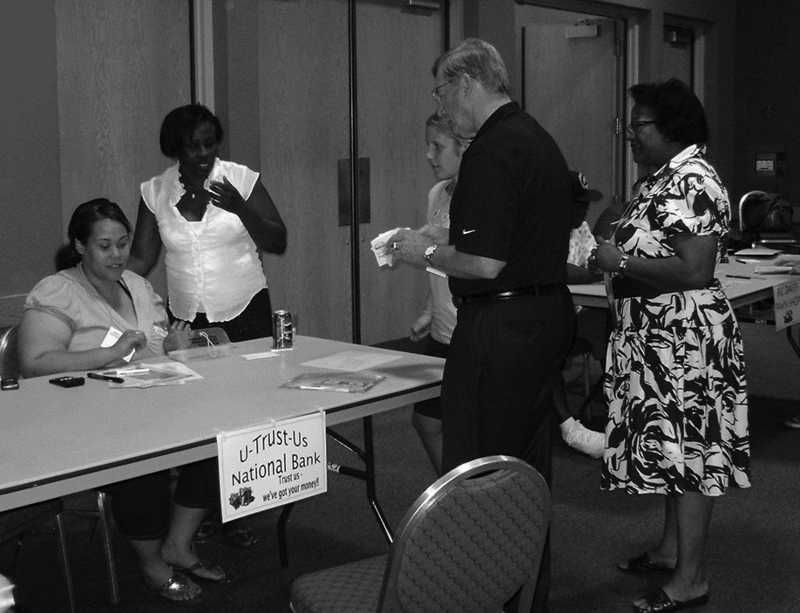 A poverty simulation is an experience designed to help participants understand what it is like to live in a typical low-income family trying to make ends meet from month to month. It is important to keep in mind that it is a simulation and not a game! The main objective of the simulation is to sensitize the participants to the realities that low-income people face. Just Harvest uses the Missouri Community Action Association Poverty Simulation Kit to facilitate the simulation. What is the purpose of the poverty simulation? The purpose of the poverty simulation is to educate the broader community. 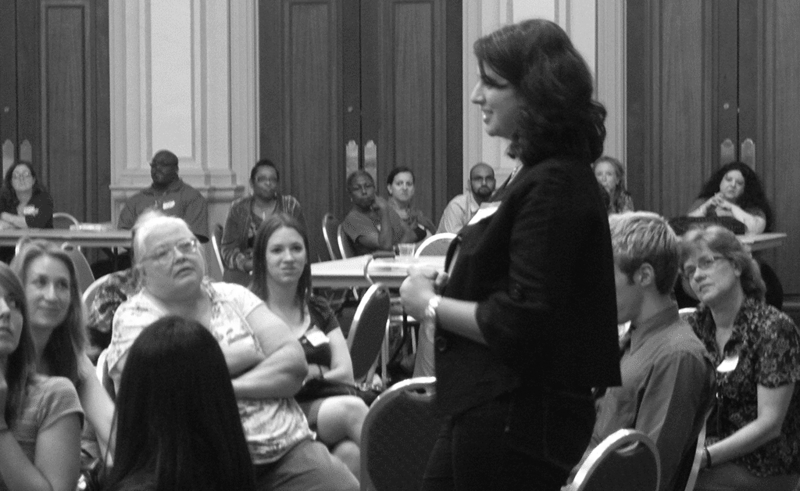 Participants encounter the real issues that low-income families deal with, the roadblocks that can be barriers to self-sufficiency, and how these factors shape behavior and beliefs. It is our hope that their experience will motivate participants to become involved in activities which reduce poverty in our community – particularly by advocating for stronger social safety net. How many people can participate in the poverty simulation? There are 26 different families facing poverty in the simulation; 44 to 80 people can participate as the families. Some of the families are newly unemployed, recently deserted by the breadwinner, or homeless. Others are on TANF (cash assistance) either with or without additional income. An additional twenty people can participate as the community resources that provide services to the families. The simulation needs to be conducted in a large room. Families are seated in the center of the room and the community resources are around the perimeter. How long is the simulation? The experience lasts 2.5-3 hours. It includes a brief introduction and briefing of the simulation exercise. There is also a guided debriefing period afterwards for participants and volunteer staffers to share their feelings and experiences. Talking about what they have learned about people living in poverty is an important part of the experience. 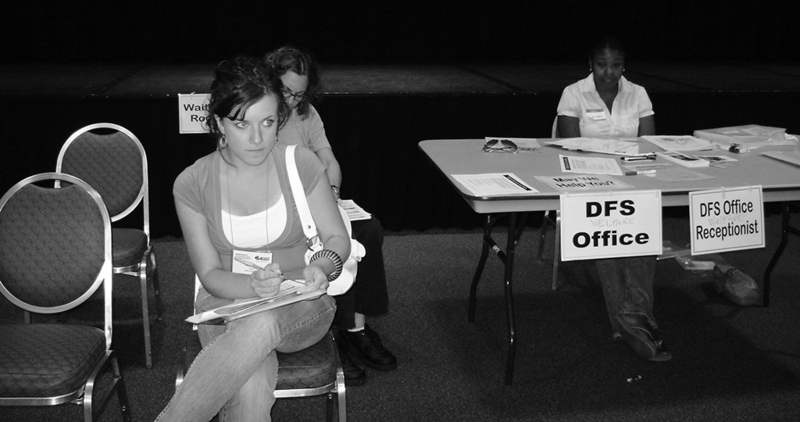 How do I go about setting up a poverty simulation for my organization or group? There are a number of logistics to nail down in order to carry out a poverty simulation. Generally your organization or group is responsible for recruiting the participants but Just Harvest can assist with this. It is suggested that the community resources be staffed by individuals who have had experience with poverty and that a small stipend be given for their participation. Just Harvest can also provide volunteer staff for the community resources if needed. We suggest starting the planning process for a poverty simulation at least two months in advance. The primary costs consist of the staff time required in organizing and running the simulation, and obtaining a sufficiently large space. In addition, Just Harvest charges a small fee for our assistance. We will discuss this in more detail when you contact us. Any questions? Ready to proceed? Contact Amanda Fry at amandaf@justharvest.org or 412-431-8960 x124 for more information. Don’t have the capacity for a poverty simulation but want info on how to address hunger and poverty in your community? We can provide your organization or event with a speaker. Contact Emily Cleath at emilyc@justharvest.org or 412-431-8960 x112 to arrange. People's minds were blown as a result of the simulation. Nearly every person I talked to that evening or the next day said something like, 'I just figured it would be easy simulating a month of poverty and I would figure it out...but then I couldn't. 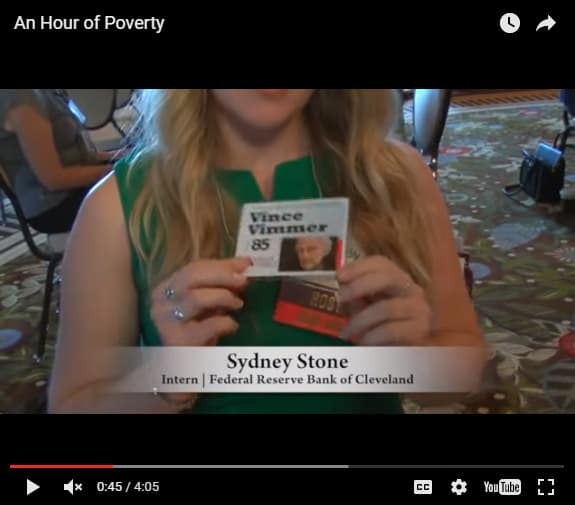 I was so frustrated, angry, nervous....'"
Federal Reserve Bank of Cleveland intern Sydney Stone talks about the struggles of her character in a recent Just Harvest poverty simulation. Click above to watch the video and read more about the experience of the Federal Reserve Bank's employees.